During the middle of the nineteenth century, genre paintings with domestic life subjects became popular in England. The new affluent middle class favored in particular genre paintings that depicted scenes of children with their pets in playful settings. 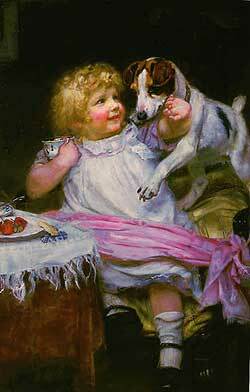 Arthur John Elsley was one of the most popular English artists who depicted such childhood scenes in the late Victorian and Edwardian periods. His works were so popular during his lifetime that many of his paintings were reproduced as prints, and were often used in calendars, advertisements, books and magazines. 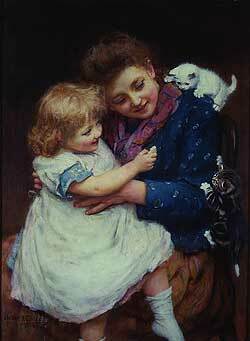 Arthur John Elsley was born on November 20, 1860 in London, England. He was one of six children born to John Elsley and Emily née Freer. His father was a coachman, and an amateur artist, who had exhibited a painting, entitled A Group of Horses at the British Institution Exhibition in 1845. However, around 1872 John Elsley was afflicted with fibroid phthisis, which forced him to retire as a coachman and take the position of resident caretaker for a firm of stockbrokers in London. In 1876, Elsley became a probationer at the Royal Academy Schools, where he studied there under Frederick Pickersgill (1820-1900, Keeper of the Royal Academy between 1873 and 1887), Edward Armitage (1817-1896, Professor of Painting 1875-1882), John Marshal (d.1896, Professor of Anatomy 1873-1890), and Henry Bowler (1824-1903, Professor of Perspective between 1861 and 1899). An avid cyclist, Elsley used to take off to the countryside on his bicycle to get inspiration for his compositions. His first Royal Academy exhibit in 1878 entitled A Portrait of An Old Pony was the only one his father would see, as he died one month later. Elsley continued to study at the Academy Schools until 1881-1882. He then began to earn his living from portrait commissions of children, horses, and dogs. During that time, he exhibited mostly domestic equestrian paintings. In addition, he painted numerous family and canine portraits for the Benett-Stanford family, who lived at Preston Manor. Many of these works are still exhibited at the Manor, which is open to the public. By the age of twenty-four, his first published known work was printed in a boy’s magazine (Young England in 1885, No. 43, April, 1885). This work was a line engraving entitled April Floods In Eastern Counties. Elsley was well acquainted with other British artists such as Solomon Joseph Solomon (1860-1927) and George Grenville Manton (1855-1932), with whom he began sharing a studio in 1876. 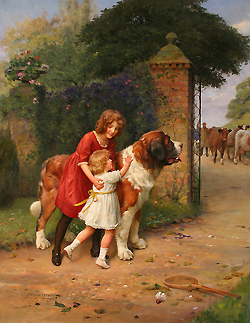 Manton introduced Elsley to Frederick Morgan (1847-1927), the popular genre painter who specialized in children scenes. When Manton left the studio in 1889, Elsley moved into Morgan’s studio, which turned out to be mutually beneficial. Morgan was already an established artist, but could not paint animals, and had collaborated in the past with a specialist in canine portraits, a role that would now be taken over by Elsley. In 1891, Elsley won a silver medal in the Crystal Palace exhibition for his painting entitled The Bailiff’s (sic) Daughter of Islington. The following year, his painting entitled I’se Biggest (1892) was reproduced as a print, and it became so popular it had to be re-engraved. 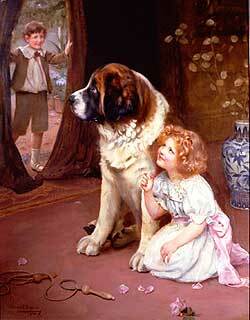 That scene of a little girl measuring her height against a St. Bernard dog was described as “one of those simple and unaffected pictures which readily lend themselves to reproduction and has so much nature and so admirable a touch of humor in it that no doubt a great numbers of those who admire it at Burlington House will be delighted to have an opportunity of hanging a version of it upon their walls,” (Parker, p. 20). Also in 1892, The Illustrated London News, the popular weekly magazine chose one of Elsley’s paintings, Grandfather’s Pet (1892), as their 1893 Christmas print. The First World War affected Elsley’s productivity. During that period, he worked part-time at a munitions factory, where he “filed the jigs used to test gun-sights in the making.” (Parker, p.11) As the work put additional strain on his eyes, he only painted four works from 1915 to 1917. Three were commercial works, and one was a portrait of his daughter Marjorie, which was not for sale but was still exhibited at the Royal Academy. In the years that followed, he continued to paint mostly for pleasure and exhibited some of his works until 1927. However, his eyesight continued to fail, and by 1931 it became so poor that he confined his activities to woodwork, metalwork and gardening. Arthur John Elsley died at his home on 19 February 1952, at the age of 91. 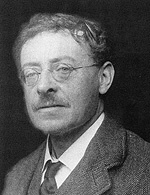 During his career, Arthur Elsley exhibited 52 works at the Royal Academy from 1878 until 1927, and many more at other major exhibition halls throughout England. These included: The Royal Society of British Artists, London; The Walker Art Gallery, Liverpool; The Institute of Painters in Oil Colors, London; French Gallery, London; Dudley Gallery, London; The Institute of Fine Art, Glasgow; Manchester City Art Gallery; The Royal Society of Artists, Birmingham; Nottingham, Castle Museum; Victoria Gallery, Bath; The Crystal Palace, London; Cork International Exhibition. Some examples of the commercial use of Elsley’s prints include: color calendars published by the American firm Thomas D. Murphy Co.; advertisement for Sunlight Soap; advertising show-cards for Old Calabar Dog & Puppy Biscuits, Brooks Sewing Cotton, and Peek, Frean & Co., Biscuits & Cakes; cover for the publication of Bibby’s Quarterly.